I have a Pi 3 which I've wiped clean, and updated to Pixel; nothing else is running on it (correction, I loaded realvnc). I'm using the graphical interface, if that makes a difference. When I plug in a memory card reader with SD or CF cards inserted, they are automatically mounted to /media/pi/, which is OK, but I'm puzzled as to how that's happening. When I plug them in, I get a "removable medium is inserted" pop-up window, with a default action of Open in File Manager. What process is mounting these media? I've searched here and elsewhere, and have not found a definitive answer, or one that appears to be the case for my pi. I've looked at /etc/fstab and etc/udev/, and neither of those shows an entry for automounting USB. I'm still figuring out /etc/systemd, but I'm not seeing an obvious rule there either. What am I missing? This seems like it would be reasonably useful knowledge for pi/linux newbies. Also, when I plug in a USB "thumb" drive when the pi is already booted, it is not auto mounted, unlike the card reader USB device. If I boot with that USB drive connected at power up, it is mounted, which to me would point to fstab, but again, no entries there that show any indication of USB. What process is responsible for automatically mounting some types of USB media like USB memory card readers? What process is responsible for automatically mounting other types of USB media like USB thumb drives when (and only when) they are connected at boot time? The auto-mounting of USB devices in Raspberry Pi is handled by the GUI/DE (as suggested helpfully by multiple folks here), which is based on LXDE, and specifically, it's controlled by PCManFM, the file manager. To disable this behavior, open the File Manager, and from the Edit menu, choose Preferences. Pick the Volume Management tab/item. 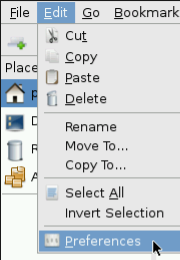 The second option, "Mount removable media..." can be unchecked to disable auto-mounting "removable" class media on insertion. The "Show available options..." setting can be disabled to prevent the pop-up window prompting for available programs. I'm guessing that the first option, "Mount mountable volumes..." is what is mounting my thumb drive when it's present at boot. The screenshot above is from an older version (wheezy? ); Jessie has a few more minor options that aren't relevant to the question, but define the behavior of File Manager when devices are mounted/unmounted. I didn't find any information about how LXDE/PCManFM classifies a USB device as either "mountable volumes" or "removable media" but for my purposes, I can disable both to simplify developing my own mounting scripts. Thanks to all of the great input here which set me on the right search path to find this. As others stated, this is not unique to Raspberry Pi, but as there are a lot of Pi users who are new to Linux, that may not be obvious. I cannot answer, but (many years ago) did investigate. It is handled by the Desktop Environment. This was first introduced by Mandrake, and now included in most mainstream distributions. If you boot to the command line, there is NO automounting. UUID=2dd6c96e-4655-4a04-a8ca-7a5fd39d09bb /mnt/PiHDD ext4 defaults,noatime,noauto 0 0 to STOP Raspbian automounting my external HD, and also to change where filesystems are mounted. This may or may not work with SD Cards. You may get more information on http://unix.stackexchange.com/questions as this is NOT specific to the Pi. Not the answer you're looking for? Browse other questions tagged usb mount lxde pixel or ask your own question. How do I setup automount of any (mountable) USB drive in Raspbian? How to automatically mount a drive? How to detect when USB drive is mounted? Is USB Pass through possible?